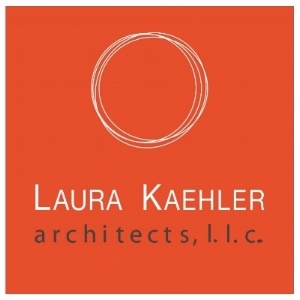 Kitchens — Laura Kaehler architects, l.l.c. We designed a contemporary one level home with views of a lake for a young family wanting a more clean and modern aesthetic. The kitchen was designed as a simple “L” shape with large island open to the family room. Cabinets along the perimeter “L” are painted a deep teal color and the island is a natural walnut with plank details at the bar sitting area. Caesarstone counter tops were used for durability and beauty. Builder: Skyview Builders, Westport, CT.
Award winning kitchen designed for a Westchester mid-century home. Our clients wanted a kitchen that was maintenance-free, highly functional and beautiful. We designed a kitchen that blended natural wood, Caesarstone countertops, back painted glass uppers and stainless steel cabinetry to provide a unique work space that allowed cooks and family members to enjoy the space. This kitchen won the top honors at the New York Cottages and Gardens IDA "Best Kitchens" awards 2016! Our clients had a galley space and wanted to maximize the use and style of this area. They wanted to keep the colors to a minimum using light neutral colors and materials with industrial materials and details. We designed the kitchen to be galley with the work space mainly on one side with a breakfast bar opposite against the windows and under a skylight. We used stainless steel angles to surround the frames of the base cabinets with "rivets" as the "jewelry" detail. A wonderful long time client asked us to redesign their kitchen to be larger, more functional using warm wood tones and stone counters in their favorite color- Blue! We removed a pantry that was right in the middle of the space, we added a square bay with windows and a built in banquette and designed a simple kitchen layout using custom modern cabinets in cherry with a stainless steel range and hood and hardware. After visiting the stone yard, it was love at first sight when we all saw the Blue Bahia stone! It was a trick to get the island's waterfall end panels to "fold over" perfectly but the stone fabricator mastered it. We designed an upholstered faux crocodile banquette in neon blue and purchased an acrylic table and chairs with a branch-like hanging light fixture above. Bright LED recessed lighting capped the overall design. Builder: Dan Valentine Builders, Stamford. Stone Fabricator: Dushi Marble, Stamford. We renovated an older stucco traditional home several years ago which included opening up the interior for an open floor plan scheme. The kitchen became the focal point of this project. We designed a white shaker style kitchen and brought warmth with the use of a stained oak floor and stained wood ribbon along the perimeter at the top of the cabinets folding down along the ends. Light stone counter tops kept it light. The addition of skylights brought in morning light to the island sitting area. Our client had a small one bedroom apartment claustrophobic but had great views. Our task was to open up the space as much as possible to allow a more vast feeling while expanding on the view to the north to the Empire State Building. We had test probes done to find out whether the wall separating the kitchen from the living/dining area had any plumbing or structure within it before we designed the space. We determined that we could remove most of the wall and created a bar seating area on the living room side facing into the kitchen work area. Since it was now all open to the living room, the kitchen had to look its best. We used dark stained mahogany cabinetry with white glass and stainless uppers and a stained mahogany "portal" to frame the bar seating from the kitchen. This "portal" functioned as both an attractive frame between the two spaces but also as a place to install shallow LED lighting. Builder: Ken Becker of Aspen Interiors. The kitchen space was unusual with two large windows looking out to Central Park! As nice as the view was, we needed cooking space, storage space, room for the appliances and a space to sit and have coffee! There is only so much room in a galley kitchen. We decided to place the coffee bar at the west facing window along with drawers on each side allowing double duty for this area. We chose to locate the rangetop against the exterior wall next to the other window with refrigerator, ovens and sink on the opposite interior wall. And since the cook wanted to be part of the party, too; we opened up the kitchen to the rest of the apartment as much as we could. We used medium stained sapele wood for the cabinetry, glass uppers to give the sense of a wider space, calacutta marble for the counters with glossy white glass tile for the full height walls. It is elegant and functional. Our clients wanted a warm yet sleek kitchen for their new apartment. We were able to remove a wall between an unused adjacent nanny's room and the existing kitchen and create a large eat-in kitchen along with a butler's pantry. We chose luxurious materials that were also very durable. We selected mahogany veneer cabinetry fronts with a leather finish black granite counter. The floor is a light tan porcelain tile. To add texture and color, we installed a multi color glass tile backsplash. We off set some of the upper cabinets in the butler's pantry area using stainless steel frames. There are two windows in the space and we designed a built-in upholstered seat at one of them with a resin and stainless table and two chairs for breakfast coffee. A hanging light marks the area. Cabinetmaker: Crane Woodworking, South Norwalk, CT.